As I announced in my most recent medical update post “It’s a Marathon Not a Sprint”, this week I started the chemotherapy cocktail FOLFIRI + the angiogenesis inhibitor Avastin (bevacizumab). I wanted to update you on how the return to chemo went. I won’t sugarcoat this decision nor the experience. I believe my writing, fellow survivors & you all deserve brutal honesty – but it is, as always, Hope filled. Hope is hard-wired into me, it is in my Root Directory – otherwise I would have to change the title of this Blog! 🙂 Cancer is a rough disease and though both I (and this Blog) are filled with Hope – I won’t gloss over the tough aspects of the disease. I believe not glossing over the tough stuff, makes my Hope-filled message more powerful. My fellow survivor readers know I get it. I am one of them. The decision to return to FOLFIRI wasn’t easy. It is a tough treatment. When I last had it in 2012 (well OK technically there was one final infusion in Jan. 2013) – the first couple of biweekly infusions were filled with continuous vomiting. I have heard a few others with the same experience but it actually is not that common. I am more sensitive than average to the acute toxic effects of irinotecan. Mentally, I refused to give up after those first couple of infusions but to be honest it was using all the will power I could muster. The trick my oncologist eventually came up with to make FOLFIRI tolerable? Knock me out with high dose iv-Ativan (lorazepam) to make me essentially drunk as a skunk. It worked. It brought the vomiting down to a “tolerable level” (that is one of those phrases which has a entirely different meaning in the cancer world than the ordinary world ha!). Using that trick, I got to pretend I was partying like it was 1999 in the infusion chair! Based upon how on felt on the ride home, probably partying with one too many shots! When I got home from the party, oops I mean the infusion center, I pretty much went straight to bed. Thankfully by the next morning, I already felt quite a bit better. This Week’s 1st Treatment Went Much Better than I Expected! I have to admit the lead-up to this Monday’s infusion wasn’t easy. There is something called “anticipatory nausea” which is very real. It is essentially a Pavlovian response. My nausea started to steadily build about 24 hours in advance, on Sunday morning. When I arrived at the infusion center they collected blood samples for various tests, I met with my oncologist briefly and then I headed to “the chair”. I had a very nice surprise. The infusion nurse is assigned to you but I have been going to the infusion center for long enough that I have cycled through all of them at one time or another. By chance, one of my favorites (Dan) was my nurse. He bent over backwards (above & beyond!!) to help me out with a “special project” I have cooking (subject of a later post!) after which I told him about the 2012 anti-nausea high-dose Ativan plan. Based upon his many years of experience and very proactive personality, Dan immediately went to work on getting OK for an alternative plan – a particularly strong anti-nausea drug named aprepitant (Emend™) – or more technically accurate fosaprepitant since I received the iv-prodrug of the active ingredient. This was a drug I had never tried in 2012. Oh boy did Dan turn out to be right!!! As soon as the iv-drip of Emend started, I could feel my nausea start to lessen. It was enough for me to fire up my computer and start to post updates to Facebook and CRC online groups. 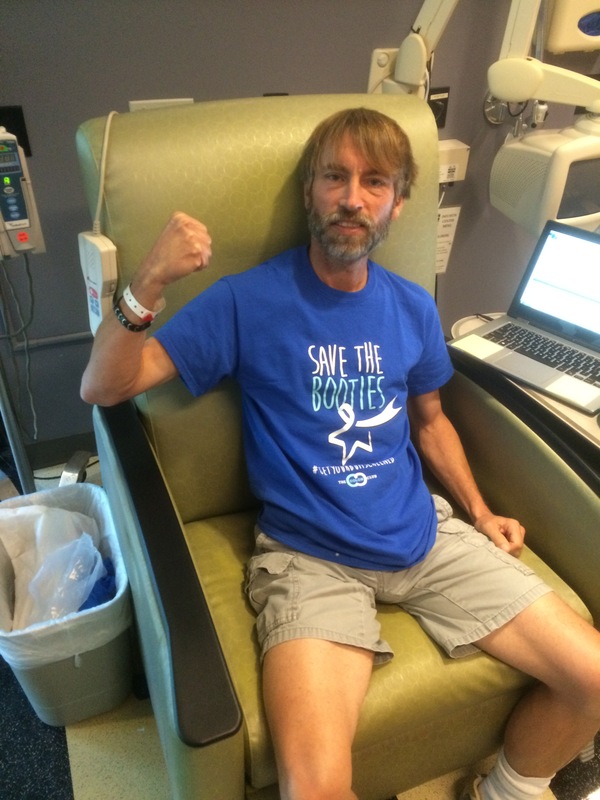 Even though I cabbed it to the infusion center and was “technically there alone” – the outpouring of support I got from online was amazing – within a short amount of time >250 messages of support arrived! I publicly thank all of you who took part in that outpouring! I was the furthest thing from “alone” in that infusion chair! We are all interconnected and in this together! With the help of Emend, the rest of the infusion was very anti-climactic – which in this setting was a good thing! I did have 1 mg of Ativan to continue to deal with the Pavlovian nausea but no more partying like it was 1999… I was nauseous but really not too bad. Emend worked wonders! It was a long day (I was at the infusion center for about 8 hours from start to finish) – but I spent most of that time working on my computer on my various CRC projects – across 4 continents (besides my first FOLFIRI infusion, it has been an abnormally busy week on the “CRC project” front as well!). I got home around the same time Amelie got home from school. I reminded her & Eleni that I had gotten “The Sleepy Medicine” and I went straight to bed. Final score: vomiting: ZERO – Emend the winner by a landslide! But these temporary physical impacts do not in any way change my feelings or message of Hope. I personally believe that EVERYTHING changed within just the past few years with the significant success of immunotherapies in multiple cancer type – including (in preliminary data) the MSI-high subtype of CRC – unfortunately not the subtype of CRC I have. The reasonable, plausible and logical possibility of an immunotherapy breakthrough for the MSS subtype of CRC (the type I and most CRC survivors have) within a <5 year time frame has caused an earthquake-sized impact in the CRC patient community – and it is actively affecting treatment decisions, my own included. Historically, CRC patients endured the side effects of pretty harsh chemo for the payoff of often additional years with their family. That is still true. That extra time with family for additional family Holidays, children’s life milestones etc is a true gift. But now there is something more. Much more. Now for many, there is an added perceived benefit of “making it long enough” to make it to that “immunotherapy breakthrough” – the timing of which no one can predict accurately. In just the past 6 months, we saw our MSI-high CRC brothers and sisters potentially reach that point with PD-(L)1 inhibitors. Although their length of response data is still pending, anecdotally it sounds very promising so far. In the patient community, we continue to hear daily from them their stories of anti-PD-(L)1 immunotherapy responses, giving us Hope for ourselves. MSS-CRC is a harder tumor to target with immunotherapies than MSI-high CRC since its tumor Microenvironment (TME) is SO immunosuppressive. But our Hope is still there via witnessing the enormous resources being thrown into immunotherapy research and next generation experimental drugs in clinical trials specifically meant to address immunosuppressive TMEs! As was just published in the journal Science last month – the vast majority of CRC tumors appear to be “seen” by the immune system. The immune system is just being blocked from doing its job – which is squarely the focus of next generation immunotherapy drugs now in early clinical trials! I am an eternal optimist that although MSS-CRC immunotherapy is a hard problem – hard problems are still solvable when a critical mass of researchers and funding makes a concerted effort to attack it. I believe we are at that moment in history with immunotherapy research – that is where I get my Hope from! So what is my treatment strategy? I plan to endure the side effects of chemo to “tread water” while waiting for that MSS-CRC immunotherapy cavalry to arrive. If interesting clinical trial opportunities (which allow my melanoma history) present themselves, I plan to ping pong on & off chemo to do these trials. My attempt to get into the NIH immunotherapy trial discussed in my post “It’s a Marathon Not a Sprint” is a perfect example of that. I occasionally get asked if the massive genetic studies started last Spring (the “A Scientific Guardian Angel Appears”) have led to any therapeutic ramifications. The ideas are still cooking but I assure you those studies continue in the background and I believe there may indeed be therapeutic options coming out of them. I need to be very creative due to my melanoma history excluding me from most clinical trials – an ultimate personal research project to end all research projects! I won’t sugarcoat it. FOLFIRI chemo is tough – even with Emend helping a lot with the nausea. After the nausea receded I got hit with fatigue but from past experience, that will recede as well. But in addition to more time with my family, it is SO worth it to me if that is what it takes to get to reach for the big picture goal: LIFE. Please keep my family and I in your thoughts & prayers and keep in touch with us as we go through it. Unfortunately the entire family is impacted by this type of chemo. The worst feeling is feeling alone when fighting a tough battle. I believe support feeds Hope and Hope feeds support! I will intentionally not get an infusion close to Thanksgiving or Christmas, I want to minimize impacts to those Family Holidays SO important to me – but I will go full force in January. Hopefully for only a limited amount of time. Enough time to smack my tumors upside the head, cause them to retreat – and then take a break either with no treatment or ideally for a clinical trial. I know I have a lot of scientist readers. I hope I have inspired you in your research by presenting the decisions and strategies I have been forced to make by a disease I never envisioned having at this stage of life – but more importantly decisions also forced to be made not just by me but by millions of Stage IV cancer patients across the world & across tumor types. You have one of the most important jobs in the world – you have the power to potentially impact millions with your work! Speaking as a CRC patient advocate, thank you! To all the other readers – thank you for the incredible support you have shown – it really does make a difference! We’re now about to take off for a much needed Holiday vacation – LIVING LFE with a Thanksgiving trip to the Grandparents’ house – before the next infusion hits the day we get back. The kids love going there so that is all they are thinking or talking about – which is exactly what I want. We didn’t chose this battle, it surprise attacked us. It’s time to tread some water while we wait for the coming cavalry. To do so is a Life based upon Hope; without Hope, none of us – cancer survivor or otherwise – would truly be Alive. Thanks for another jaw-dropping post, Tom. Your enthusiasm is inspiring! I pray for you daily, as well as all those in the medical field who are eagerly searching for breakthroughs to this horrible disease. Wishing you a peaceful, joyous time with your loved ones this Thanksgiving, and safe travels. Thank you akasleen – among the people inspiring ME daily are YOU! Thank you for your incredible friendship this year – and I wish you and your entire family a WONDERFUL Thanksgiving this year. I know it is a very special one for you and them! So sorry you have such a rough time. Wondering if you ever tried Aloxi. It is also a very long lasting anti nausea infusion that works for many. However, dynamite is required to have bowel movement after that. Hi Sue – I did try Aloxi in 2012 – didn’t do the trick for me (I think all patients are a bit different – why oncologists like a palette of choices to try) – for me, specifically Emend did the trick! Much better than being knocked out for infusion! True. The Aloxi helps me but the constipation is crazy. Thank you so much for your open and honest overview of how you reached your current treatment decisions and how you are responding to the treatments. I am so glad to hear that the Emend helped a lot!!! That’s a true answer to prayer!!! Also, a big thanks for the visual analogy of “treading water” during this course of your treatment, until something new comes along in the “research world for MSS CRC patients!!! That’s what I feel that my husband is doing while he is participating in the TAS trial. We are so thankful for the great quality of life that he has continued to have!! We are HOPEFUL, as you are, that there will be some new treatment options available sometime in the near future!! In the meantime, we too want to live life to the fullest!! It’s definitely a team effort!! We wish you and your wonderful family the very best as you enjoy the holidays!! Thanks so much for serving the CRC community in such a powerful way!! And thank you Cindie for your friendship this year! May you and your entire family have a wonderful Thanksgiving too! I actually miss cold weather seasons for Thanksgiving & Christmas – I may be near your neck of the woods next summer! I’m glad you enjoy my Blog Jim! Best of luck in your fellow travels, I’ll check out your blog! Truth = Hope on so many levels. I am praying each day for your health, your outreach, your research (and that of others), thanking God for your amazing spirit. Blessings on you and your family during the holiday season. Thank you Susan 🙂 I hope you and your entire family have a wonderful Thanksgiving and Christmas as well! “Treading water”. Good analogy. Keep treading water, my friend. Your “treading water” seems to include more “living life” than 99.99% of us. Hah – doing your posts / Cancer stuff all day long from the chemo chair. You’re probably like the only person on earth who does that!!! Great post Tom. Your knowledge and character have inspired me to keep my head up and eyes open for anything and everything possible to help my mother, who is also suffering with this disease! I’m glad to hear that Josh – Hope is hard-wired into me but I think there is also a logical basis in this case too – so I am glad that you are inspired. Please give your Mom my very best! Rock on Tom!! wish you all the best for this wave of treatment – and a relaxing and joyful vacation! hope to see you at gnf one of these days and catch up. Thanks Rob! Would love to catch up sometime – it has been quite the ride this year with plenty of interesting stories! Thanks Tom. Your words are truly inspiring to a fellow Stage IV survivor! Getting ready to start my second round of Chemo after three resections in four years. Keep the faith…..can’t wait until your next blog. Hi Mike, I am glad you enjoyed this post, thank you for the comment. Indeed you keep the Faith too! Good luck with your next round! Tom, I like your idea of ping ponging on and off chemo while waiting for the Calvary. I have been off chemo for a year due to the unbearable side effects. My lastests scans are not good. I think it is time to get more chemo. Just heard about Emend from someone else today as well, I plan to request it for my sig. other. since he has just had a very rough first cycle experience w chemo. Much nausea/v on day two. We will do things differently in two weeks! Thanks! Have a wonderful Thanksgiving.